ALTON, Va. – Joey Hand gave himself one job at the Michelin GT Challenge at VIRginia International Raceway Sunday – pass one of the Corvettes at the drop of the green flag, to give he and co-driver Dirk Müller a chance for the win. He did it, overtaking the No. 4 championship points-leading Corvette for p2 at the start of the race. 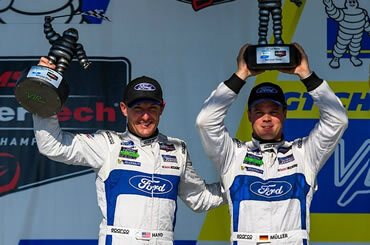 Then he held on, handed off to Müller and the two combined for a p2 and their third podium of the year, and second in IMSA WeatherTech SportsCar Championship competition. “This was one of those races where we thought we had a pretty good race car,” Hand said. “The ‘Vettes were obviously quick all weekend long, but we had a good car, too. Going into the start of the race, I knew the important thing for me was going to be to get at least one car and come out of it in second, then go race the No. 3 car, which we thought was the faster car. It worked out. It got a little bumpin’ and bangin’ out there and I got a little crossed up with the traffic behind me but made it out alive and went racing. The No. 66 team’s sister car, the No. 67 Ford GT, started at the back of the pack after switching tires after qualifying, trading in the short-term benefit of starting with the rest of the GTLM class for a strategy they felt would give drivers Richard Westbrook and Ryan Briscoe the best shot at a win. Luckily, they finished well ahead of the No. 4, the only team ahead of them in the standings. Briscoe and Westbrook wound up just off the podium at p4, while a late crash for the No. 4 Corvette put them p9. The No. 4 team still leads the points, but only by seven with two races remaining. The IMSA WeatherTech season continues at Circuit of the Americas Sept. 14-17.